Truly Scrumptious: Who Needs a Bed . . .
Who Needs a Bed . . . When there is a perfectly good changing table to sleep on. A week and a half ago we set up Amelia's new "big girl" bed. So far night times haven't been a problem, but nap times aren't working out so well. To be fair, they weren't working out so well when she was still in the crib. I still put Amelia in her room for a nap, and while she stays in her room, she doesn't stay in her bed. Often she doesn't fall asleep at all (which I wouldn't mind too much if she wasn't completely beastful once 5 o'clock comes) and instead plays in her room for an hour and a half or two. The room is always in some state of disarray when I get her from her room. Today I noticed that after about a little over an hour, it was quiet in Amelia's room. I went in to check on her and found her asleep on her changing table. What a monkey! 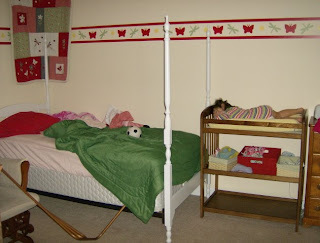 Those bronze looking metal bars are the bed rails Erik's sister Allison used when she was a girl. They often wind up on the floor during nap time. 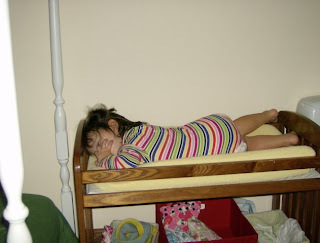 I took them off for a bit, but Amelia fell out of bed last night, so Erik put them back up. Also it may look like it is really light in Amelia's room, but actually the room is quite dark - the light was from the camera's flash. On another note, I'm sure if someone asked you what color your child or childrens' eyes were (presuming you have a child or children) I'm guessing you would be able to answer that question. Not me. Amelia's eyes still seem to be changing colors, and I'm wondering if they will ever settle into one color. They are not quite green and not quite brown. 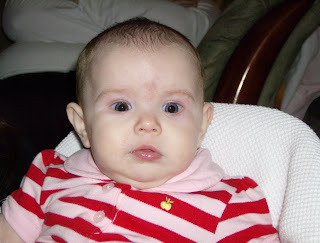 Charlotte's eyes, on the other hand, are 7/8 baby gray, and 1/8 brown. Go ahead and click on the picture and see. It's crazy! Omigosh I laughed so hard when I read this! Amelia is so hilarious! Love all the crusties in Charlotte's nose too.